Cora Van Den Bosch, age 95 of Holland, passed away Wednesday November 8, 2017 at American House in Holland. She was born in Holland, and married George Van Den Bosch in 1944. 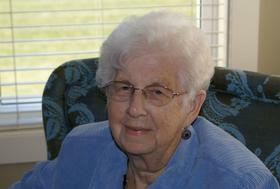 Cora was a member of Maplewood Reformed Church and was involved in many different organizations over the years. Cora had a love for quilting and made many quilts which were donated to church missions. She is preceded in death by her loving husband George of 55 years; son-in-law, Mike Reidsma; and great-grandson, Noah Tidball. Cora is survived by her daughters; Carol (Les) Baumann; Nancy Reidsma; grandchildren, Chad (Shawn) Baumann, Erin (Chris) Lowe, Katie (Dan) Tidball, Angela (Derick) Stegenga, Travis (Johnna) Staat, Rachel (Preston) DeRidder, Rebecca (Greg) Quist; 13 great-grandchildren; sister, Dorothy Schrotenboer; sister-in-law, Hazel Assink, and many nieces, nephews, and cousins. The family would like to thank Hospice of Holland, American House, and Cora’s special friends for their care, love and support. In lieu of flowers, please consider donating to the Juvenile Diabetic Research Fund.